To Cite: Jafarpour F, Estomaguio G A, Vahid Dastjerdi E, Soheilifar S. Nasal Morphology in Filipino Samples With Class I, II, and III Jaw Skeletal Relationships, Iran J Ortho. 2014 ; 9(3):e4847. doi: 10.17795/ijo-3744. Background: Facial morphology of Asians differs from those of whites and blacks. However, none of the available studies had assessed nasal morphology in Asians with different skeletal malocclusions. Objectives: The aim of this study was to compare cephalometric nose morphology among Filipino female and male adults with skeletal class I, II and III relationship. Patients and Methods: All patients were of Filipino background and had a lateral cephalogram as part of orthodontic records. Upper and lower facial height, nose height, nose length, nose tip projection, were measured in cephalograms. Results: Facial height did not differ significantly in genders and malocclusions. There was not any statistically significant differences in linear measurement of the nose among various malocclusion, while, nose length and height were greater in males and nose tip projection was larger in females. Conclusions: Filipino males have longer nose with less prominent tip in comparison with females. Angular measurements of nose are larger in class II malocclusion in comparison with class I and class III. Nowadays, obtaining ideal facial esthetic is one of the goals of orthodontic treatment (1). Nose morphology, along with chin and lips consist the key components of facial profile which their harmony play an important role in facial esthetic (2). Orthodontic treatment and orthognatic surgery may alter nose morphology (3). In addition, in recent decades, there is an increasing interest in cosmetic rhinoplasty (4). Knowing normal nose morphology and size is important for surgeons and other specialties (5). Nasal morphology and anatomy differs significantly between different racial groups (6, 7). Morphological features of nose have been evaluated in different racial groups (4, 8-11). Facial morphology of Asians differs from those of whites and blacks (12). Structural characteristics of Filipino population have been assessed in several publications (12-14). Nasal morphology in Filipino children was evaluated in Barone et al. (12) study. Moldez et al. (13) have established cephalometric hard tissue norms of Filipino population. However, none of the available studies had assessed nasal morphology in Filipino adults with different skeletal malocclusions. The aim of the present study was to compare nasal morphology in female and male Filipino adults with skeletal class I, II, and III malocclusions. This study with a descriptive design was conducted in the University of the East, Graduate School Clinic, Manila, Philippines. Research and medical ethics committee of East University approved the study protocol. Informed consent was signed by all participants. The inclusion criteria for the selection of subjects were the following: orthodontic patients with at least 75% Filipino race of their grandparents with the age of 18 to 30 years old with skeletal Class I (ANB = 1 - 3˚, overbite and overjet = 1 - 3 mm), II (ANB = 3 - 5˚, overbite and overjet > 3 mm), and III (ANB = -1 to -3˚, overbite and overjet ˂ -1 mm) malocclusions. The exclusion criteria were as followed: subjects with previous history of any kind of orthodontic treatment, splint therapy, dental prosthesis, orthognathic surgery, plastic surgery, trauma particularly to the orofacial region, temporo-mandibular joint disorders, medical condition that would affect the growth of the mandible and maxilla, systemic syndromes and craniofacial anomalies. A questionnaire containing questions regarding medical and dental history, age, gender, citizenship, place of birth, and also, the ethnic background and Filipino percentage of the respondent’s parents and grand parents was given to each patient. All patients had a lateral cephalometric radiograph as part of orthodontic records, obtained from one X-ray unit (Digital x-ray machine, Vatech) at University of the East, post graduate clinic, Manila. The radiographs were taken in standing position with the Frankfort plane parallel to the floor. A soft tissue attenuator or shield was positioned within the tube head according to the patient’s size. The lips were in relaxed position and the teeth were in centric occlusion. After clinical examinations and interviews ninety one patients (39 males, 52 females) were recruited. Cephalometric tracings were performed by one researcher. All relevant linear measurements of the soft tissue profile particularly those related to the nose were traced and measurements were made. Table 1 shows the parameters which were used for analyzing nose morphology. Figures 1 show the illustration of some measurements. Each cephalometry was traced twice with one-week interval by the same researcher and standard error was calculated using Dahlberg’s method. The standard error of all cephalometric measurements was below 0.5 millimeters for linear measurements. Figure 1. Measurement used for assessing nose morphology and their definition. Descriptive statistics (means and standard deviation) calculated using SPSS program version 16.0. The results were tabulated. The differences between the groups were compared using two-way ANOVA. After clinical examinations and interviews ninety one patients (39 males, 52 females) were recruited. Table 2 and 3 show the descriptive characteristics of samples. Mean upper facial height (UFH), measured by N-ANS, was 44.9 ± 3.3. Mean UFH in class I, II, and III malocclusions were 44.6, 44.9, and 45.4, respectively. Mean UFH in female and male samples were 45.5 and 44.1, respectively. UFH was not statistically significant different between malocclusions (P ˂ 0.818) and genders (P ˂ 0.58). Mean lower facial height (LFH), measured by ANS-Me, was 55.2 ± 3.5. Mean LFH in class I, II, and III malocclusions were 55.7, 55.1 and 54.8, respectively. Mean LFH in female and male samples were 54.7 and 55.8, respectively. LFH was not statistically significant different between malocclusions (P ˂ 0.674) and genders (P ˂ 0.140). Mean distance of N’-Prn was 46.3 ± 5.4. Mean N’-Prn in class I, II and III malocclusions were 45.6, 46.9 and 46.4, respectively. This difference was not statistically significant (P ˂ 0.232). Mean N’-Prn in female and male samples were 43.5, 49.4, respectively, which was statistically significant (P ˂ 0.0001). Mean distance of Prn-Sn was 19.5 ± 4.9. Mean Prn-Sn in class I, II and III malocclusions were 18.5, 18.6 and 21.3, respectively, which was not statistically significant (P ˂ 0.73). Mean Prn-Sn in female and male samples were 20.6 and 18.1, respectively, which was statistically significant (P ˂ 0.021). Mean distance of N’-Sn was 50.2 ± 5.8. Mean N’-Sn in class I, II and III malocclusions were 50.6, 51.2 and 49.1, respectively, which was not statistically significant (P ˂ 0.502). Mean N’-Sn in female and male samples were 47.9 and 53.3, respectively, which was statistically significant (P ˂ 0.0001). In this cross sectional study, some linear parameters were measured in lateral cephalograms of Filipino adults with skeletal class I, II and III malocclusions. Upper and lower anterior facial height were not statistically significant different between various genders and malocclusions. This result is in contrast with those of Moldez et al. (13), who reported that in most age ranges of Filipino subjects, both measurements were statistically greater in males in comparison with females. The difference in results may have been encountered as a cause of the fact that in Moldez et al. (13) study patients with class I occlusion and acceptable facial profile were selected in order to establish cephalometric norms. Nevertheles, our samples were heterogeneous, including adults with different skeletal mal-relationships. In addition, since different malocclusions would appear in various facial heights (15), it is not surprising that the difference between class I, II, and III malocclusions were not statistically significant. Linear measurements of the nose were statistically significantly different in males than females. The results imply that males have longer nose with less protruded nasal tip in comparison with females. Nasal length (N’-Prn) and nasal height (N’-Sn) was larger in males. In Prasad et al. (16) study nose length and depth was larger in males of south Indian. In Paul et al. (17) study the nasal height (N’-Sn) was statistically larger in male of three ethnic background of Nigerian population in comparison with females. Nasal tip protrusion (Prn-Sn) was statistically significantly greater in females. However, in Sforza et al. (18) study, all of the linear measurements were greater in white Italian males than female. This difference would occur because of ethnical differences between Asians and Whites. Our result is somehow in accordance with results of Jayaratne et al. (19) study, who reported that mid-columella length, but not exactly nasal tip projection, was the only parameter which was not greater in Chinese males. None of the linear measurement had statistically significant differences among various skeletal malocclusions. 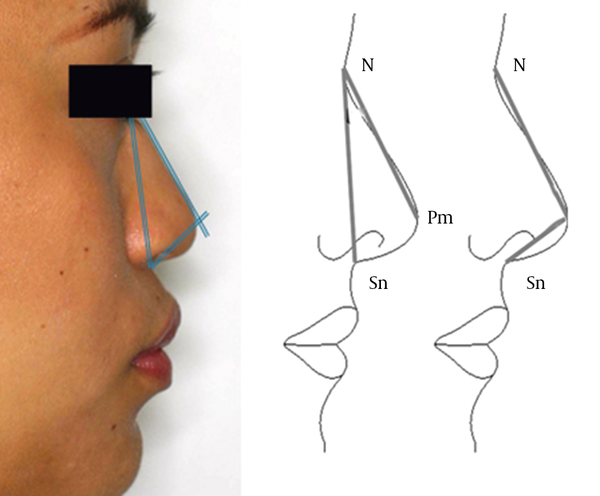 Wisth (20) reported that nasal length and nasal inclination relative to SN line was similar in all sagittal malocclusions. However, nasal depth was significantly different among groups, attributed to different sagittal relationship. The differences in results again may appear as an ethnical variability. When correlated with maxillary skeletal discrepancy, nasal length had insignificant correlation with SNA angle and N perpendicular distance to A point in Prasad et al. (16) study. The results of present study revealed that female Filipinos have shorter nose with greater projection of nose compared with males. Authors’ Contributions: Fariborz Jafarpour did his postgraduate study under supervision of Gary A. Estomaguio, Elaheh Vahid Dastjerdi, and Sepideh Soheilifar helped to develop the manuscript and background and discussion. Funding/Support: The authors have not received any financial aid or support for this study.